Bundle up! How to prep your sterndrive, outboard or PWC for a long winter's sleep. Story and Photos by John Tiger, Jr. Here's how to prep your sterndrive, outboard or PWC for a long winter's sleep. The lucky among us live in Southern climes, where boating and watersports are year-round activities. For those of you who live north of the Mason-Dixon line, its most likely time to haul your water toys to the garage and get them ready for a long winters nap. Winterizing must be done properly so that when boating season arrives again, the engine starts and runs like it was never put away in the first place. Doing it yourself isnt difficult; it just takes a little know-how and attention to detail. Boats and personal watercraft (PWCs) are winterized in much the same way, and even though PWCs have two-stroke engines, some of the procedures used in winterizing them are the same as used when prepping a four-stroke sterndrive. Some of the procedures are the same as when winterizing an outboard, too  so owners of PWCs need to pay careful attention, as their craft need special care in order to survive the cold weather. Before you do it yourself, get a factory service manual for your make, model and year engine, and study the section on storage preparation. The process of conditioning the fuel is the same for any internal combustion engine, so we can go over it once for all three types of watercraft. I am a proponent of using too much fuel conditioner as opposed to too little. Too little usually keeps fuel stable for only a few months, leaving gummy varnish in the carburetors, EFI injectors and the rest of the fuel system by the time winter is over. Too much leaves a little larger dent in	your wallet when you purchase it, but saves big repair bills later. If the boat has a water-separating fuel filter, change the canister now before you start treating the fuel. This will ensure that any water in the system is removed. The conditioner is mixed with the fuel in the boats tank before its run for the last time, so that treated fuel ends up throughout the fuel system, not just in the tank. If you have only one boat, you can cut this mixture by half so you dont have so much treated fuel left over when youre done. After the boats fuel supply is treated, the fuel line is disconnected and the engine is hooked to and run on the tank. This way, the cocktail gets into the engines fuel system and crankcase. Lamb goes so far as to paint his storage tank blue (to symbolize cold, for winter) so it isnt mistaken for any other tank. 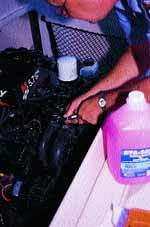 Outboard engines are clearly the easiest and least time-consuming of marine engines to winterize. The most common cause of storage-related failure is water left in the engine block to freeze; ice forms, expands and cracks the block. With outboards, that shouldnt be a problem as all the water drains out of the exhaust outlets and propeller hub as long as the engine is tilted all the way down after running it. With the worry of a cracked block or manifold out of the way, emphasis centers on three main areas: fuel conditioning; cleaning and then  pickling the engines innards; and making sure theres no water in the gearcase lubricant. After running the engine for five to 10 minutes on the boats treated fuel, switch to the storage mix tank and run it for another few minutes. Remove the air silencer cover and rapidly inject engine tuner (a high-detergent cleaner) into the throats of the carburetors or fuel injection air tubes. Some engines have ports built into the fuel system and use special engine tuner oil cans to connect to these fittings. The cleaner will help wash carbon deposits from your outboards spark plugs, cylinder heads, piston tops, and piston rings. After squirting a healthy dose in, shut the engine off and let it sit for at least a half-hour (engines that have not had this treatment in awhile need to sit for several hours to let the tuner fluid work on the baked-on carbon deposits). Start the engine up again and resume spraying in the tuner until the can is empty. Next, spray engine storage fogging oil into the same orifices. This coats the insides with a thick film, protecting the bearings and metal surfaces from condensation and rust. The fluid will try to choke the engine, and youll see a lot of smoke; thats OK. You may need to rev the engine slightly to keep it running as you squirt the oil into all the cylinders  just dont rev it over 1500 rpm in neutral. After you fog the engine, shut it down  do not run it out of fuel, especially if its an oil-injected engine (the oil pump will continue to run, making it hard to start again in spring). Remove the spark plugs and add a teaspoon of outboard oil (or spray more fogging oil) into each cylinder, then after removing the kill switch to prevent accidental starting, slowly rotate the flywheel to distribute the oil in the cylinders. If this is not possible, bump the key a few times (again, with the kill switch disconnected) so the engine turns over once or twice. Check the tilt fluid and top off if necessary; then tilt the engine down fully and drain the gearcase lubricant. While it drains, check the lubes color for water (contaminated lube will appear milky) or excessive metal shavings. If the lube is black and smells burnt, and the lower fill plug has large metal shavings on it, take it to the dealer for repair. Tiny metal filings are OK, and indicate normal operation. Fill the unit with fresh lubricant, and replace the fill/vent plug gaskets if theyre torn or broken. Grease all fittings on the engine (usually on the tilt mechanism, swivel bracket, steering tube and cowling latches) with a good waterproof grease. Spray the entire powerhead and electrical wiring with silicone lubricant, and touch up any missing paint (especially on the gearcase and center section). Replace any zinc anodes that are more than halfway eroded. Finally, give the entire engine a coat of protective wax. If youre not going to store the rig in a heated garage, be sure to poke a pipe cleaner or probe into the gearcase water inlets and (if equipped) speedometer pitot to remove any debris that might be trapping water. Cover the propeller exhaust outlet with a plastic bag to keep water (and pests) out. Consider removing the prop if its stainless to prevent theft. If the prop is worn or damaged, now is a good time to send it out for repair and reconditioning. Remove the battery, charge it fully and check that the water level is correct. Store it in a cool, dry place. All the fuel, fogging and battery storage procedures apply to PWCs just as they do for outboards, with a few special areas of concern. First, be on the lookout for inline fuel filters, and change these before you begin winterizing. Second, be sure to grease the driveshaft fitting and any other grease fittings. For winterizing expertise here, I turned to Karl Hogemann, ace Polaris technician at Progressive Motorsports of Hudson Falls, New York (518/747-4693). The cooling system on a PWC is similar to that of an inboard or sterndrive, and must be drained and then filled with RV-type (red) environmentally safe antifreeze. Its a pretty simple procedure; the engine is run out of water for just a few seconds, then the water inlet hose is disconnected from the jet pump and held high while its filled with antifreeze. The liquid will quickly run out the water discharge, indicating that it has traveled through the block and exhaust manifold. Check your service manual very closely for any drains, petcocks or hoses that should be removed in order to completely drain the system. Any little puddle of untreated water can freeze and crack the block or exhaust manifold. The rest of the winterization is quick and easy: Fog the engine as described for outboards; remove and store the battery; wet the entire engine, electrical system and jet drive with a spray silicone lube; and store the boat in a dry place (or at least cover it securely). As with PWCs, the cooling system is the main area of concern here. All inboard and sterndrive engines have a few petcocks that are either turned or removed in order to drain water from the block, exhaust manifolds, and hoses. These petcocks can become clogged with debris; poke a wire into the drains to remove the debris and allow water to drain. Temporarily remove the water hoses that feed the block and manifolds, and pour red RV antifreeze into them until it runs out of the petcocks. Drain the fittings located on power steering coolers, and (on EFI engines) knock-sensor assemblies and fuel coolers. The importance of a service manual cannot be overstated here. MerCruisers manual has a very good and detailed section on winterization procedures. The engine must be fogged to ensure that the engines inner workings are not exposed to condensation and rust over the winter. Most carbureted engines can be fogged by slowly pouring a little 20-weight oil or engine storage fogging oil down the throat of the carburetor while the engine runs at a fast idle, then rapidly pouring the rest down the throat to choke off the engine. On newer EFI engines, follow the service manual. Typically, it involves pouring a small amount of outboard oil into the water separating fuel filter, then running the engine to let it ingest the oil. After the fogging is done, change the engine oil and filter. As with an outboard, the drives gear lubricant must be changed at this point; keep in mind that a sterndrive will use a lot more lube than an outboard. To ensure that the winterization has been done properly, the outdrive should be removed so that the universal joint can be greased and the gimbal bearing checked for wear. Most boaters will leave this to the dealer, and it can be done every second season to save a bit of cash and make winterization easier (see Inspecting an Outdrive, July 2000). The drive should be touched up if paint is missing, and the speedometer pitot and cooling ports must be probed with a fine wire to be sure theres no water trapped inside. Ditto for the prop; if its damaged, send it out for refinishing while the boat sleeps. Lastly, coat the electrical system and engine block with a fine mist of silicone spray. With a few special tools (in some cases, only simple hand tools), a factory service manual, and a flushing attachment, you can easily perform these winterization steps in a little more than an hour or so  but just to be safe, you should budget a morning to do the entire job, and a day if you must cover and store the boat. Costs for supplies usually will run less than $50  even if you have all three types of engines to winterize. Keep in mind, however, that occasionally youll need to bring the rig to the dealer for a check-up; even though you can successfully get it ready for winter, you may not be able to check all the potential trouble spots before they become problems. Belts, hoses and wires are easy items to check visually, and you should keep a watchful eye on these areas so that you can replace them or bring the boat in for service before they fail. Other areas  such as the water pump, gearcase seals and power trim components  are probably out of the repair ability of most boaters; have these items checked by a dealer at least once every two seasons. On this PWC, the cooling system relief valve must be removed (two screws) and drained, then checked before reinstalling it. The PWC driveshaft grease fitting is very important; if its not greased, the driveshaft can seize, resulting in an expensive repair job. This outboards oil injection reservoir has a filter that should be checked and cleaned, if not replaced. Fogging the PWC carburetors must be done with the air silencer cover removed, so all carb throats receive equal amounts of fogging oil. Changing gearcase lubricant is a must on both outboards and sterndrives to ensure that no water sits in the unit over the winter. Clean the combustion chambers and then fog the outboard; this Evinrude uses a special can that has a fitting to match the one on the engines primer. This eliminates having to remove the air silencer. Check to ensure all water is drained from the sterndrive engines cooling system. After draining the cooling water from a sterndrive engine, remove the coolant hoses and flush the system with RV antifreeze. Gearcase water drains and intakes should be cleaned with a small probe; here, we use a tie strap end to work loose any debris. In-line fuel filters must be replaced; this one on an OMC V-6 outboard is less than $5 and easily accessible. A special winterizing cocktail can be kept in a designated 6-gallon fuel tank, and used only for prepping engines for storage; here, a dealer connects the tanks hose to a MerCruiser sterndrive fuel line.